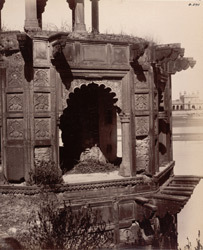 Photograph of the tower on the north-west corner of the Chini-ka-Rauza at Agra, from the Archaeological Survey of India, taken by Edmund William Smith in 1893-94. The Chini ka Rauz, or Tiled tomb, is believed to be the mausoleum of Afzal Khan, a minister of the Mughal Emperor Shah Jahan (r.1628-58) who died in 1638. Built on a square plan, it has a bulbous central dome and a mosaic façade decorated with elaborate floral patterns composed of enamelled tile fragments. This view shows a detail of the uppermost floor of the octagonal tower which faces the River Jumna. "At the north-west corner of the enclosure, commanding a fine view of the river, is a picturesque tower crowned by a cupola, which, like the kiosks around Akbar's tomb at Sikandra, was originally coated on the outside with enamelled tiles... [it] is three stories high and built of brick faced with stone, beautifully carved with geometrical and floral designs ( see Plate V) [this image]."